What's Up, that's the name of a new messaging service for our mobile phones. Oh no, wait a minute, it's no app, it is a boardgame. Well not exactly a boardgame, more a card game and it is small. It could easily fit into one of the famous tiny ADLUNG game boxes. 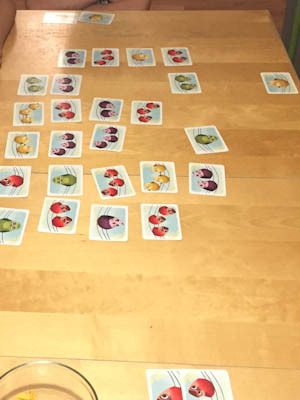 But the box of What's up is bigger, because NSKN GAMES has founded a new game company, called STRAWBERRY STUDIO, which creates small, funny and easy to learn card games and all of the new games shall fit to the same box design. 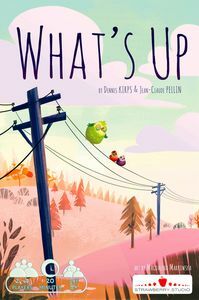 What's Up is one of the new titles and indeed it is already a very good one. 30 double sided cards and rules that can be explained in just one minute are enough to create an entertaining, challenging game. Compare it: skat has 32 cards, most math up games 40 or 50 cards, but What's up gets along with 30 cards. Basically, what we find in the box is a typical math up or memory game. Therefore, the first thing we have to do is shuffling all cards and placing them on the table. You can do so in a 5x6 grid, but it is even more fun to place them unorganized. Every card features one to three birds in one of four colours. It is the players' aim to get collections of these cards, while each colour presents an own collection. Cards must be taken in order, so a card with two birds must not be taken, before a player possesses the 1 bird card of the same colour. The game is played in turns and on every turn a player may take one card. Depending on the number of players, the game is won, if a player has completed a specific number of collections. Quite easy, isn’t it? Well, it is not. The reason for this is that all cards are double sided and on his turn a player must flip the card he has chosen first. Therefore, not the number and colour of the birds he sees is what counts. It is what's on the other side. And this is a mess, I can tell....Only if after flipping the card fits to the player's collections, he may take it, otherwise it must be placed back on the table. Of course, with progressing time, players more and more know what's on the other sides and if you are lucky, the player next to you has flipped a card, you still need and you are allowed to take, just before it is your turn. Then you are able to flip it once more and add it to your collections. But experienced players pay attention to the needs of other players, too, and will not do you the favour, if they are not in need to do so. According to my ecperience, it is nearly impossible to remember all other sides on the table, mainly because you are always distracted by what you can see. Therefore, the publisher has given us some hints. On the flip side of a card we always either find the same number of birds of a different colour or birds of the same colour. That helps, but as you will see, it is still difficult enough. Like every other memory game, What's Up is great fun to play. Children as well as grown-ups puzzle over what's on the other side of a card. 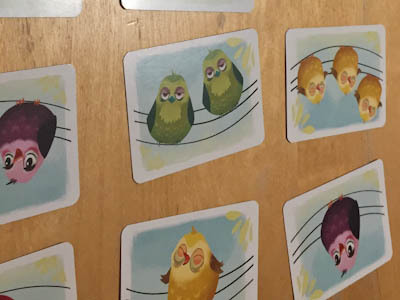 With the cute artwork of the birds, I can recommend the game to every fan of match-up games. It is great to take along, looks nice and with its short game duration, it encourages to play the one or other rematch. A promising start for the new series of games.